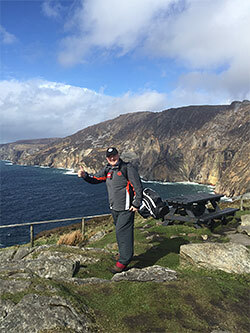 Golf industry veteran Nick Edmund has marked four weeks walking Ireland’s spectacular Wild Atlantic Way by reaching the half-way point on the first part of his Herculean trek. Despite undergoing a full hip replacement operation in early December and carrying a set of golf clubs on his back, the 56-year-old cancer survivor and former Faldo Design Managing Director has now completed 500km of the 2,000km charity walk he is undertaking as the launch campaign for his Global-Golf4-Cancer fundraising and awareness-building organisation. Having set off on 4 March from Ireland’s most northerly point, Malin Head, Nick has now walked the coasts of Donegal and Sligo counties and this week begins hiking his way through County Mayo. Along the way he is stopping off at every golf club he passes to play the 4th hole, planting the Global-Golf4-Cancer flag on each one. So far he has raised the Global-Golf4-Cancer 4-flag at 14 of the 22 courses he will be passing on the initial stage of his walk. He is due to reach the half-way point on 1 May in Galway before taking a break for the summer to avoid the tourist traffic and to protect himself from the sun – Nick is in remission from skin, head and neck cancer. He will then resume the trek on 4 September in Galway, finishing at the Old Head of Kinsale on 1 November. Nick’s amazing Wild Atlantic Way walk, which IAGTO is supporting as an official sponsor, is raising money and awareness for the west of Ireland charity, Cancer Care West. By the time he finishes, Nick aims to have the Global-Golf4-Cancer flag flying on 44 golf courses. His eventual aim is for golf clubs across the world to support the organisation’s efforts and fly the flag at various times to help boost the profile of their own local cancer charities, and to inspire the golf community generally. Reflecting on his first four weeks on the road, Nick admits the going has been tough. But he adds: “While I am feeling shattered every evening with sore feet and aches in places I didn’t know existed, I am somehow getting through it; moreover I feel fitter and stronger than I did at the end of the first week. “Without the incredible encouragement and support I'm receiving from the golf clubs and the wider Irish public it's hard to imagine it being possible – and indeed I’m sure I'll look back one day and wonder how on earth I got through it. But then it's amazing what you can achieve when you put your mind to it and when the desire to complete (this walk) is far greater than any transient pain felt ‘along the Way’. Even with his mind focused on walking through the pain and getting to the end of each day, Nick has been able to enjoy the spectacular sights he has passed on his walk. Among the latest highlights he notes have been watching the colours of spring unfold on a daily basis, visiting the towering sea cliffs at Slieve League – which are twice the height of the more famous Cliffs of Moher – and some unseasonably fine weather capped by a dramatic sunset of purple and indigo hues at Bundoran. He lists among his most ‘refreshing’ moments to date as a pint of Guinness in the Beach Bar at Aughris Head and relaxing in the Seaweed Baths at Enniscrone. But his most poignant moment was a chance encounter with fellow long-distance charity walker Stuart Hamilton, who spent 11 months walking east to west across America 10 years ago including having to pause midway when he was diagnosed with cancer, while both were staying at the Sandhouse Hotel in Rossnowlagh. “He is a tremendous guy and it was really bizarre that we should be staying in the same hotel!” says Nick. To download images from Nick’s walk, click here.